I know - this has nothing at all to do with my stay in China. But it made my evening. I laughed until beer came out of my nose - and kept on laughing. Priceless. The clenched-tooth smile barely choking back the bitter taste of bile from His Santorumness. 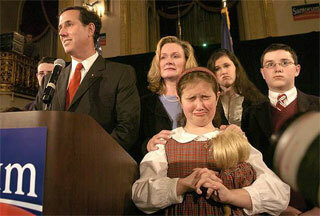 Lip-biting humiliation from Her Santorumness. A pudgy spoiled frown and a perfect deer-in-headlights rendition. And the kicker, I can’t even look at it without cracking up. I’m going to have to leave the room. The doll. The gingham dress with lace collar. The matching headband. All of it oozing privilege. And that sour - yet oh so hilarious face. Eyes scrunched on the brink of tears, cheeks cocked and mouth primed for tears. Kudos to the photographer for catching it at the perfect moment. I’m going to rot for this, stooping to their level, picking on three poor kids for the sins of their father - but at least I only picked on half of his kids. The monkey that was my great-great grandfather made me do it. Brandnew - Under Consideration starts up a branding discussion site. Non Newtonian! - This fulfills one of my childhood dreams. Sacrificial goats - Sacrificial goats. Hahahahaha! She kind of reminds me of that news clip of when one of Bush's daughters totally stuck her tongue out and squinted her eyes at the media cameras from inside her daddy's limo. Spoiled brats, all of them! Coooooool, a pool filled with corn starch! i can't believe that's a real photo! it couldn't have been staged more perfectly. No kidding on the spot-on timing - somebody should buy that photographer a beer. unfort. I have no idea who even took it!